A true Winchester original, this white box line of semijacketed .44 Magnum ammunition is a fantastic revolver or lever gun option. With the proven 240 grain jacketed soft point bullet, this ammo is suitable for hunting and self-defense but budget priced so you can get your practice in at the range without feeling bad about it. 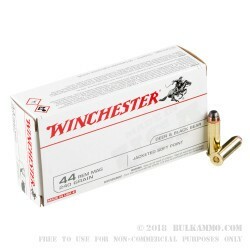 Generally considered among the more reliable lines in ammunition, the “White Box” from Winchester is increasingly popular for its ability to be used across the spectrum of use cases. This .44 Magnum is no exception. Yes, you can find hotter ammunition for hunting or personal defense, but no, you cannot find a better deal for what you get, generally speaking. With this 240 grain load variant, you get a heavy hitting, reliable ammunition that is sure to stop the largest threats or the largest game you’d be comfortable shooting with a handgun. It simple works every time. 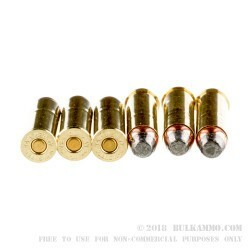 The high grain weight and substantial powder load makes this a relatively brisk load but it tends to roll rather than pop on recoil, and ensures you have the ballistics you need to stop a threat or take an animal without having to rely on backup shots. 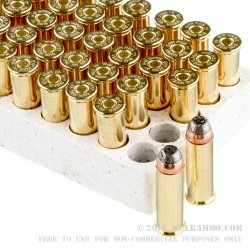 You also don’t need to buy overpriced ammunition when this cartridge is an option. Good old fashioned Winchester innovation, carried through the generations until it is produced as a commodity because Winchester has built it into such. 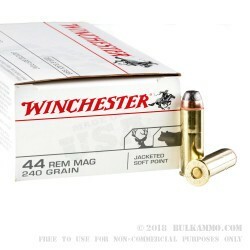 That is the story of the semi jacketed soft nose .44 Magnum. Q: What is the velocity of these rounds? A: Hello Jeff, Winchester lists the velocity of this round at 1180 fps.